This glossary of terms provides definitions of terms commonly used throughout IMS Global that users may wish to better understand. It is by no means an exhaustive list of definitions related to our communities, but it has been carefully crafted in the hopes that it will aid in the facilitation of shared understandings of interoperability. AccessForAll — AccessForAll® is a standard developed by IMS Global Learning Consortium. AccessForAll provides accessibility to users by matching user needs and preferences with the characteristics of available resources. These preferences are not meant to convey information such as medical history. Instead, they include information about how the user can interact best with a computer. The user's need for specific kinds of content, display features, or control mechanisms are recorded. This information can then be used to select or request appropriate adapted content, configure a visual display for easy reading, or locate resources that match the user's control requirements. For more information see IMS Global's Accessibility ProjectGroup Activities and IMS App Note: Enhancing Accessibility through IMS Global Standards. Higher education institutional members may be interested in the Accessibility Innovation Leadership Network; for more information see Higher Ed Innovation Leadership Networks. Accessible Portable Item Protocol — IMS Global has developed two tightly connected standards that the assessment community worldwide is using to improve learning, Question and Test Interoperability® (QTI®) and Accessible Portable Item Protocol® (APIP®). APIP offers students access to digital assessments on the first day of class that is customized to their personal learning needs with minimal or no modifications necessary so that teaching can proceed without interruption and results are transmitted faster than with paper-based assessments. APIP is a solution for authoring and delivering test items to students in a way that supports consistency of the delivery of every item. For more information see IMS Global's Accessibility Project Group Activities and the IMS App Note: Enhancing Accessibility through IMS Global Standards. Higher Education Institutional Members may be interested in the Accessibility Innovation Leadership Network; for more information see Higher Ed Innovation Leadership Networks. APIP — APIP is the abbreviation for Accessible Portable Item Protocol, a standard developed by IMS Global Learning Consortium. See the definition for Accessible Portable Item Protocol for more information. Assignment and Grade Services — Assignment and Grade Services is one of the Learning Tool Interoperability® (LTI®) extensions that is a part of LTI Advantage. This extension enables passing of assignment results from the tool back to the LMS. 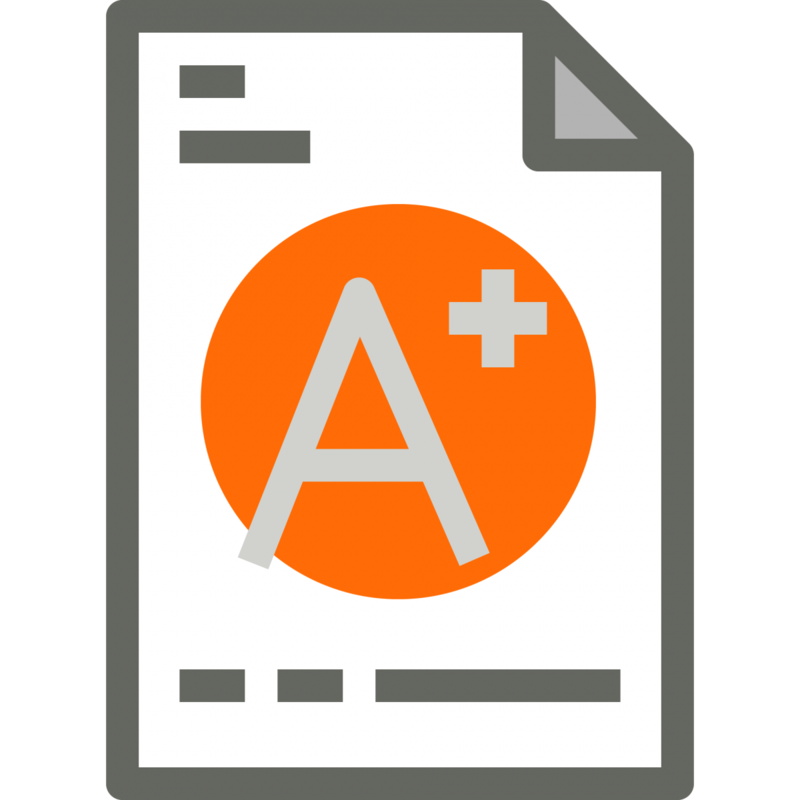 Assignment and Grade Services enables faculty to sync grades and comments in third-party tools into a single place, such as the LMS grade book, which gives students and faculty a clearer picture of learning progress in one place. 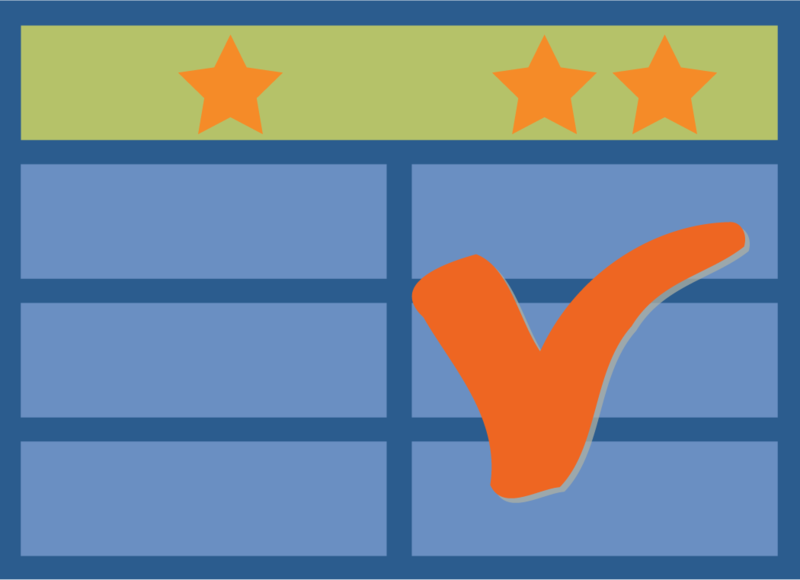 With Assignment and Grade Services you get multiple benefits including gradable assignments shared with a tool, numeric scores returned to LMS grade book, assessor's comments returned if provided, multiple results supported in a single exchange, and instructor override and history of attempts allowed. For more information, see the LTI Advantage Overview. Badge Extensions for Education — Badge Extensions for Education, an IMS Global Learning Consortium initiative, augments the Open Badges work with important accreditation and assessment information to help employers and others better understand what was required to earn a badge. Badge Extensions for Education are two optional extensions, "Assessment" and "Accreditation," to the Open Badges standard that allow an Open Badge to contain even more information about the achievement and issuing organization. First, the Assessment extension allows detailed information to be included pertaining to the assessment completed by the badge recipient. The Assessment extension describes the type of assessment (exam, performance, or artifact), whether it was a group assessment with a group evaluation, and information about how the assessment is scored. The Accreditation extension provides a way for the issuing organization to include information about related accreditation bodies, including their name and contact information, accreditation time period, and the accreditor's area of focus. For more information, see IMS Global's Digital Credentialing Initiative and Digital Credentials and Badges Project Group Activity. Higher Education Institutional Members may be interested in the Digital Credentials & CBE Innovation Leadership Network; for more information see Higher Ed Innovation Leadership Networks. Caliper Analytics — Caliper Analytics® is a standard developed by IMS Global Learning Consortium. Caliper establishes a means for consistently capturing and presenting measures of learning activity; defines a common language for labeling learning data; provides a standard way of measuring learning activities and effectiveness; and leverages data science methods, standards, and technologies. Caliper provides the means to collect click-stream data from all digital resources that can be streamed into an institutions dashboard of choice to view student interaction with digital tools and inform instructional design to better understand the return on learning for their technology investments. For more information, see IMS Global's Education and Digital Analytics Initiative and Caliper Analytics Project GroupActivity. Higher Education Institutional Members may be interested in the Learning Data & Analytics Innovation Leadership Network; for more information see Higher Ed Innovation Leadership Networks. Candidate Final- This term applies to the state of a specification (standard) under development. A specification from which at least two independent and interoperable implementations from different code bases have been developed, and for which sufficient successful operational experience has been obtained, may be voted on by the project group or task force to be placed into Candidate Final Status. A Candidate Final is normally considered to be a near final specification, and changes are likely to be made only to solve specific problems encountered or to address conformance. Candidate Final/Public Draft - A Candidate Final/Public Draft Release is developed by the Project Group after it has been released as a Candidate Final. The Candidate Final /Public Draft Release addresses any implementation issues brought forward from the Candidate Final and includes conformance and certification information. At this time, the Candidate Final/Public Draft Release is also released to the public for review and comment. CASE — CASE® is the abbreviation for Competencies and Academic Standards Exchange®, a standard developed by IMS Global Learning Consortium. See the definition for Competencies and Academic Standard Exchange for more information. CC — CC® is the abbreviation for Common Cartridge®, a standard developed by IMS Global Learning Consortium. See the definition for Common Cartridge for more information. CLR - CLR is the abbreviation for Comprehensive Learner Record, a standard currently under development by IMS Global Learning Consortium. See the definition for Comprehensive Learner Record for more information. Common Cartridge — Common Cartridge® (CC®) is a standard developed by IMS Global Learning Consortium. Common Cartridge provides a way to package and exchange learning content and assessments. Common Cartridges can contain the actual content, or links to the content via Learning Tool Interoperability links, all with metadata, and curriculum standards metadata that describes the content. Cartridges can be developed once and loaded into multiple different learning environments. Thin Common Cartridge is a subset of the full Common Cartridge that contains only links and metadata about the content. Today’s digital content comes from a variety of resources making it difficult to integrate. Common Cartridge solves this problem by providing a standard way to package learning content so that it can be exported from one system and imported into another, providing educators and students with greater choice and flexibility to share and reuse content to personalize learning. For more information, see IMS Global's Digital Curriculum Initiative and Common Cartridge Technical Specification Documentation. Competencies and Academic Standards Exchange — Competencies and Academic Standards Exchange® (CASE®) is a standard developed by IMS Global Learning Consortium. CASE is at the center of all the ways that learning standards impact the teaching and learning process. CASE is a framework for digitally transmitting learning standards, competencies, rubrics, and the relationships among sets of learning standards. By implementing CASE, educators have a more reliable way to ensure digital content is properly aligned to learning standards, and systems that are traditionally course-based can now have access to related competencies that are taught in a course, module and topic. For more information, see IMS Global's CASE Project Group Activity and Competencies and Academic Standards Exchange (CASE) Field Descriptions, a spreadsheet which provides definitions and descriptions of CASE elements and attributes for a non-technical audience. Competency Framework — IMS Global's Competencies and Academic Standards Exchange® (CASE®) standard uses the term competency framework to refer to academic standards documents published by organizations such a state department of education and individual learning standards. See Competencies and Academic Standards Exchange for more information. Comprehensive Learner Record - Comprehensive Learner Record (CLR) is a standard currently being developed by IMS Global Learning Consortium. CLR is part of the family of IMS standards for digital credentials. The others, Competencies & Academic Standards Exchange (CASE) and Open Badges are compatible with CLR. Comprehensive Learner Records are a new generation of secure verifiable digital records for learners that contain all nature of learning experiences and achievements including courses, competencies, skills, co-curricular achievements, prior learning, internships, and experiential learning. Additionally, the Comprehensive Learner Record may include the learner’s plan or pathway towards their goals. For more information, see IMS Global's Digital Credentialing Initiative and Digital Credentials and Badges Project Group Activity. Higher Education Institutional Members may be interested in the Digital Credentials & CBE Innovation Leadership Network; for more information see Higher Ed Innovation Leadership Networks. Content Consumer — IMS Global’s interoperability design relies on two important roles: consumer and provider. Consumers and providers can be related to tools, content or services. A Content Consumer ingests content. A Content Consumer would also typically be a learning management system. Content Provider — IMS Global’s interoperability design relies on two important roles: consumer and provider. Consumers and providers can be related to tools, content or services. A Content Provider hosts the content to be used in the Consumer. Examples of Content Providers include an externally hosted platform or server containing an open educational repository or "for-purchase" digital content. Deep Linking - Deep Linking is an LTI Advantage extension. 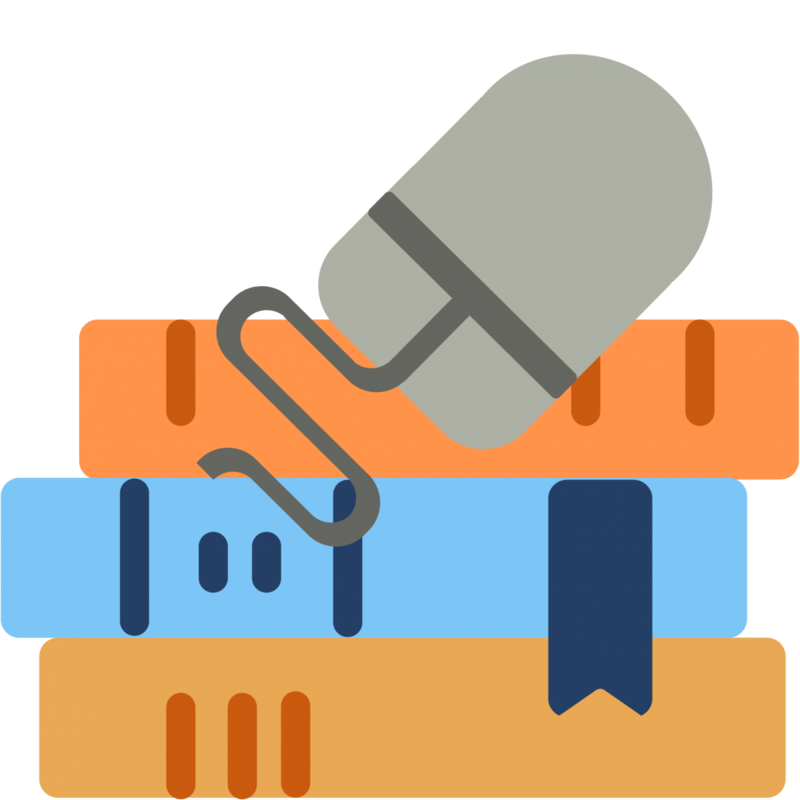 This extension simpliﬁes the arduous task of selecting and adding links to content when developing a course, including deep integration to collections of content such as playlists and a table of contents. With Deep Linking you can select and add course content in a few clicks; add playlists and tables of content; enable links and other HTML content; and add pre-registered tools with a few clicks. For more information, see the LTI Advantage Overview. Digital Ecosystem - The digital ecosystem is all the various platforms, applications, tools and ways in which those systems are connected to pass data among the systems. By creating standard ways to transmit data between these platforms, applications, and tools, school districts can reduce costs, time and increase the effectiveness of the teaching and learning cycle. ePub - ePub for Education is a profile for digital publishing targeted for an education audience. ePub focuses on defining accessibility features, learning objectives and assessments which can be included in digital publishing. For more information see, ePub for Education. Final Release - Specification documents and associated technical documents—developed in Task Forces and Project Groups—that are intended for external publication as IMS Global Learning Consortium documents which have been approved by the Technical Advisory Board (TAB). HED - HED is the abbreviation for Higher Education. ILN - ILN is the abbreviation for Innovation Leadership Network. See Innovation Leadership Network for more information. Innovation Leadership Network - An Innovation Leadership Network (ILN) is a collaborative group of institutional leaders working together on an area of common interest. There are K-12 and Higher Education ILN groups. These groups meet virtually and are open to Institutional Affiliate and Contributing Members. Learning Impact Awards - The annual Learning Impact Awards are conducted to recognize outstanding, innovative applications of educational technology to address the most significant challenges facing education. Any product or service provider, educational institution, or training provider that meets the competition’s eligibility requirements can enter the competition. Entries are assessed in eight areas including accountability, affordability, adoption, interoperability, access, quality, innovation and organizational leadership. Award winners are announced at the Learning Impact Leadership Institute. Learning Impact Leadership Institute - The Learning Impact Leadership Institute is IMS Global's annual conference focused on digital innovation to improve access, affordability and quality of education. This event held is held in May. At Learning Impact, meaningful progress to accelerate the deployment of an interoperable ecosystem is made together through a commitment to open standards. Learning Information Services - The Learning Information Services (LIS) standard is the definition of how systems manage the exchange of information that describes people, groups, memberships, courses and outcomes within the context of learning. It is a large set of services that include standard ways of exchanging data about people who are participating in learning; exchanging information for people attending courses; exchanging information about course structures; exchanging information about outcomes (grades) and providing processes for the transfer of large amounts of data. For more information, see Learning Information Services Background Information. Learning Tools Interoperability - Learning Tools Interoperability® (LTI) is a standard developed by IMS Global Learning Consortium. Learning Tools Interoperability(LTI) establishes a standard way of integrating rich learning applications (often remotely hosted and provided through third-party services) with platforms like learning management systems, portals, or other educational environments. LTI enables districts to securely connect their learning platforms and tools while reducing the time and significant costs associated with developing separate product integrations. LTI has several additional services and messages that can be used to extend it, including Assignment and Grade Services, Deep Linking and Class Provisioning. With LTI, institutions can maximize the effectiveness and capabilities of the teaching and learning ecosystem while saving time and money through a scalable and seamless approach to securely integrate multiple sources of digital content, learning tools, and assessment products into the digital learning environment. For more information, see IMS Global's Learning Apps and Tools Initiative and Learning Tools Interoperability Project Group Activity. Higher Education Institutional Members may be interested in the Learning Tools Interoperability (LTI) Leadership Innovation Leadership Network; for more information see Higher Ed Innovation Leadership Networks. LILI - LILI is an abbreviation for Learning Impact Leadership Institute. The preferred abbreviation is Learning Impact. See the definition for Learning Impact Leadership Institute for more information. LIS - LIS is the abbreviation for Learning Information Services, a standard developed by IMS Global Learning Consortium. See the definition for Learning Information Services for more information. LTI Advantage - LTI Advantage, introduced in October 2017, is a package of key LTI extensions that enable institutions to move beyond first generation learning architecture through deeper integration that ensures better teaching and learning experiences. LTI Advantage is a package of extensions that build on the core LTI standard (v1.1 or higher) to add new features that enable deeper integration of any tool with any LMS. LTI Advantage makes it easier for faculty to innovate and meet the unique learning needs of students, save time spent provisioning courses, and dramatically reduce integration times. Currently, the LTI Advantage extensions are Names and Role Provisioning Services, Deep Linking, and Assignment and Grade Services. For more information, see the LTI Advantage Overview. LTI Extensions - LTI extensions add additional funtionality to core LTI to improve user experiences. These additonal services can exist individually or all together depending on the type of product involved. 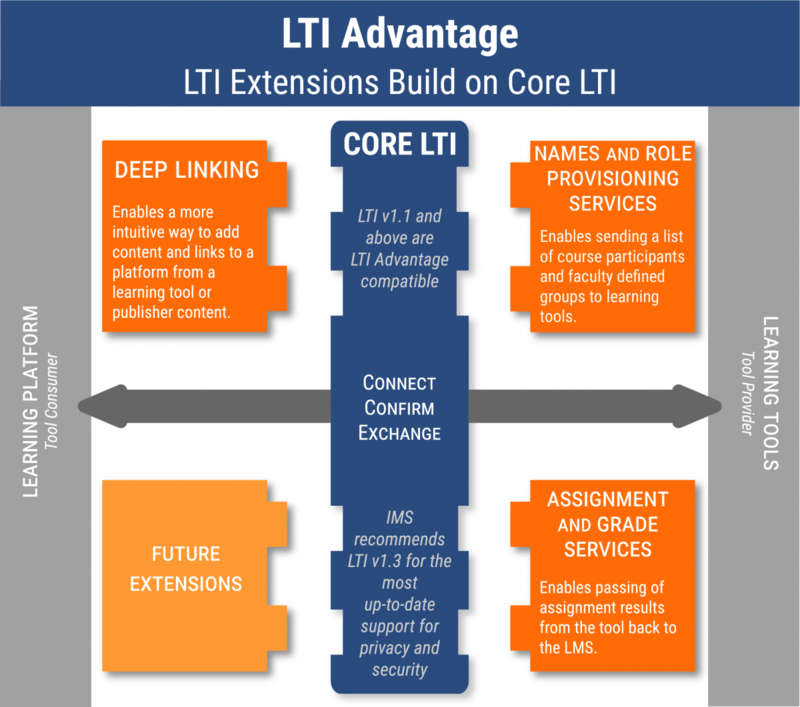 Currently the LTI Advantage extensions include Names and Role Provisioning Services, Deep Linking and Assignment and Grade Services. For more information, see the LTI Advantage Overview and Learning Tools Interoperability Project Group Activity. LTI Resource Search - The LTI Resource Search standard defines how learning tools and learning platforms search learning object repositories (LORs), and other catalogs of learning resources, for learning objects. The goal of the Resource Search standard is a common way for students and teachers to be able to search resource providers, such as learning object repositories, from single sources or aggregated from multiple sources, within a learning object consumer such as a learning management system or another educational platform. Names and Role Provisioning Services - Names and Role Provisioning Services is an LTI Advantage extension. This extension enables sending a list of course participants and faculty defined groups to learning tools. For more information, see the LTI Advantage Overview. OneRoster - OneRoster® is a standard developed by IMS Global Learning Consortium. OneRoster allows for the exchange of roster data between learning management systems and student information systems and learning tools. The data exchanged can include information about students, teachers, classes, grades and course materials. Institutions can save valuable instructional and administrative time with a low cost and scalable way to streamline the management and secure delivery of digital IDs, product use rostering, and transmission of assignment, scores, and grades across all digital resources. For more information, see IMS Global's Educational Data and Analytics and Digital Curriculum initiatives and OneRoster Project Group Activity. Open Architecture - Open architecture is a way of designing technology systems that is designed to make adding, upgrading and swapping components easy. IMS Global focuses on open architecture that allows educational institutions to add and change components within their system. For example, this might be a student information system or learning management system or a content provider. Open Badges - Open Badges are portable image files which include information about accomplishments associated with the image. In other words, Open Badges contain detailed metadata about achievements. Who earned a badge, who issued it, and what does it mean? The data is all inside the badge. IMS Global is responsible for managing and advancing the Open Badges standard. The Open Badges standard provides a secure framework to digitally capture and visually present achievements that are verifiable and portable to help learners differentiate their career-readiness or college-readiness in an increasingly competitive world. For more information, see IMS Global's Digital Credentialing Initative and Digital Credentials and Badges Project Group Activity. Higher Education Institutional Members may be interested in the Digital Credentials & CBE Innovation Leadership Network; for more information see Higher Ed Innovation Leadership Networks. Question and Test Interoperability - IMS Global has developed two tightly connected standards that the assessment community worldwide is using to improve learning. The first is QTI® (Question and Test Interoperability®) and the second is APIP® (Accessible Portable Item Protocol®). QTI enables the exchange of a wide range of rich questions and tests. QTI enables testing from formative quizzes to formal summative high stakes tests. And it allows all kinds of data to be transmitted between authoring tools, item banks, test construction tools, learning systems, and assessment delivery systems, and scoring administrative systems. QTI provides an easier way to administer fully accessible digital assessments, both formative and summative, that provides actionable data in a more timely manner to teachers, students and parents to inform personalization of learning. For more information see IMS Global's E-Assessment initiative and Question and Test Interoperability Project Group Activity. State and large district assessment leaders may be interested in participating in the State Assessment Leaders Innovation Leadership Network, for more information see the K-12 Innovation Leadership Networks. Request for Proposal - Requests for Proposals (RFP) are documents that identify a need and ask organizations to respond by explaining their solution, its cost, and their qualifications. IMS Global provides numerous resources to help with creating RFPs, for more information see Require IMS Global Certification When Purchasing EdTech Products. RFP - RFP is the abbreviation for Request for Proposal. See Request for Proposal for more information. 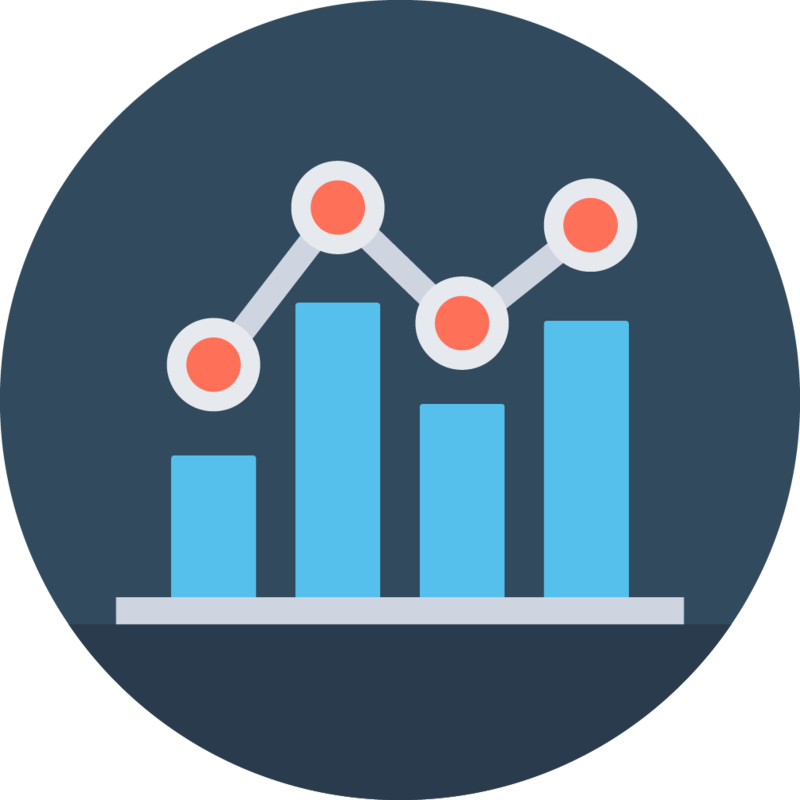 SensorAPI - SensorAPI®is a web service, a technical software, for implementing the standard, Caliper Analytics®, and simplifies the process of gathering learning metrics across learning environments. For more information, see IMS Global's Education and Digital Analytics Initative and Caliper Analytics Project Group Activity. Higher Education Institutional Members may be interested in the Learning Data & Analytics InnovationLeadership Network; for more information see Higher Ed Innovation Leadership Networks. Service Consumer - IMS Global’s interoperability design relies on two important roles, consumer and provider. Consumers and providers can be related to tools, content or services. A Service Consumer ingests the provided data from a Service Provider. Service consumers and providers are often similar kinds of applications such as learning management systems, student information systems, digital content libraries. Service Provider - IMS Global’s interoperability design relies on two important roles, consumer and provider. Consumers and providers can be related to tools, content or services. A Service Consumer ingests the provided data from a Service Provider. Service consumers and providers are often similar kinds of applications such as learning management systems, student information systems, digital content libraries. TAB - TAB is the abbreviation for Technical Advisory Board. See Technical Advisory Board for more information. Technical Advisory Board - The Technical Advisory Board (TAB) operates as a committee of the whole to review and approve the activities of its various Task Forces and Project Groups which are the primary working bodies of the TAB for initial specification chartering and development. The TAB contributes to the technical excellence of IMS solutions for education interoperability by providing advice and consultation on recommended technical directions; suggesting improvements and updates to IMS working group practices when appropriate; identifying and actively participating in resolving inter-specification issues or conflicts; identifying areas of overlapping responsibility or conflict between Project Groups; and helping staff technical research projects required to evaluate new technology options, by going beyond the resources on the technical working groups and leveraging their organization or network more broadly. Thin CC - Thin CC is the abbreviation for Thin Common Cartridge, a standard developed by IMS Global Learning Consortium. See Thin Common Cartridge for more information. Thin Common Cartridge - Thin Common Cartridge® (Thin CC) is a standard developed by IMS Global Learning Consortium. Thin CC is a standardized way topackage and exchange Learning Tools Interoperability (LTI) Links, Web Links and metadata. It is a subset of Common Cartridge. The content within a Thin CC is remotely hosted so that all that is transmitted in the Thin CC is metadata and information about how to access the content that is remotely hosted. See Common Cartridge for more information. For more information, see IMS Global's Digital Curriculum Initative and Common Cartridge Technical Specification Documentation. Tool Consumer - IMS Global's interoperability design relies on two important roles, consumer and provider. Consumers and providers can be related to tools, content or services. A Tool Consumer consumes or ingests the tool. A Tool Consumer typically would be a learning management system, virtual learning environment or other learning platform. Tool Provider - IMS Global's interoperability design relies on two important roles, consumer and provider. Consumers and providers can be related to tools, content or services. A Tool Provider provides or hosts the tool to be used in the tool consumer. Examples of Tool Providers include an externally hosted testing platform or servers containing an adaptive learning platform or a virtual lab simulation. W3C - The W3C is the World Wide Web Consortium, an international community where member organizations, a staff, and the public work together to develop web standards. WCAG - WCAG standards for the Web Content Accessiblity Guidelines, these are a series of guidelines for improving web accessbility. These guidelines help make web content useful to all users.